Clive Greensmith, cello. Clive Greensmith joined the Tokyo String Quartet in 1999 and has performed with the quartet at the most prestigious venues and concert series across the United States, Europe, Australia and the Far East. 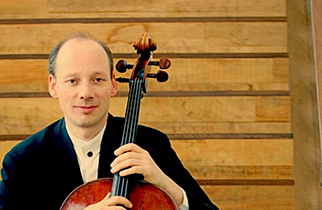 Previously, he has held the position of principal cellist of London’s Royal Philharmonic Orchestra. As a soloist, he has appeared with the London Symphony Orchestra, the Royal Philharmonic, Toronto Symphony Orchestra, English Chamber Orchestra, Mostly Mozart Orchestra, Seoul Philharmonic, and the RAI Orchestra of Rome. He has collaborated with distinguished musicians such as Leon Fleisher, Claude Frank, Alicia de Larrocha, Sabine Meyer, Midori, András Schiff and Pinchas Zukerman, and has won several prizes including second place in the inaugural “Premio Stradivari” held in Cremona, Italy. A regular visitor to many international festivals, Greensmith has performed at the Marlboro Music Festival, the Salzburg Festival, the Edinburgh Festival, the Pacific Music Festival, the Sarasota Music Festival and the Norfolk Chamber Music Festival Yale Summer School of Music. Greensmith’s recording of works by Brahms and Schumann with Boris Berman was recently released on the Biddulph label. Recordings with the Tokyo String Quartet include the complete Beethoven quartets, and the Mozart “Prussian” quartets. Greensmith has served on the faculties of the Royal Northern College of Music, Yehudi Menuhin School and San Francisco Conservatory of Music. Greensmith is currently a faculty member at the Colburn Conservatory of Music and the Meadowmount School of Music. A graduate of the Royal Northern College of Music and the Musikhochschule in Cologne, his principal teachers were Donald McCall and Boris Pergamenschikow.